Volcanoes - Are they Good for Us? We have had a plane-free few days, the sky has been blue with no contrails and the lack of aviation noise pollution has meant that we can hear the birds again. Travellers had a lot of disruption, cost and inconvenience, but this is a lesson in how connected our systems are. Stop flights, and the Kenyan flower industry goes to pot: Flowers go to waste . Fruit imports go down, and school exams have to be rescheduled. This is not good. It shows how much we rely on other countries for food and energy. 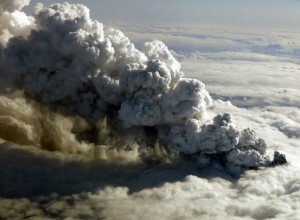 The other worry expressed is that the Icelandic volcano Eyjafjallajokull is spewing out more carbon than we are saving by having no flying. It has been estimated to emit 150,000 tons of carbon; the flights grounded would have put 344,109 tons into the atmosphere - a net saving of 206,465 tons of pollution. We are going to be facing a future with less flying, as fuel costs rise so that the era of getting on a plane to New York for a couple of days will seem as outlandish as travelling by horse and cart. There is no realistic way to fly aircraft on hydrogen or electricity, and biofuels cause too much damage and agricultural loss to be contemplated. The unpronounceable volcano has given us a glimpse of a more local, more communitarian future, if we have the wit to see it.